The Super Shot is primed for virtually any cold foods you want to zap into a hot, fresh, plate-Ready state-instantly! 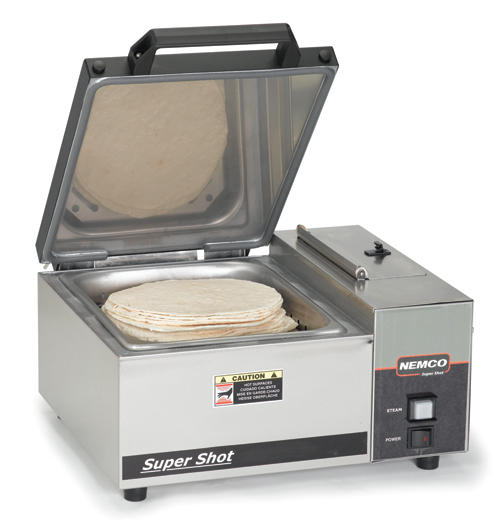 Ideal for buns, rolls, bread and other baked goods, and just perfect for tortillas. Also great for melting cheese. This powerful little appliance could wind up being one of the most versatile tools in your entire kitchen. Using super-hot steam-hotter than 212°F-the Super Shot reheats foods and restores their fresh-made flavor in seconds! Make day-old bread, buns and baked goods taste like they just came from the oven. It’s ridiculously easy to operate. Simply plug it into a standard outlet, fill the reservoir with tap water, then use the push button to deliver a pulse of amazing steam. One year warranty. Click here to view Nemco products warranty. For information on any of our 100,000 items, phone us, fax us, or use the link below to send us e-mail.